During the 12 weeks ending August 12, meat retail sales continued to follow trends set out in the past two updates, according to data from Kantar Worldpanel. With much of the country continuing to have experience warm, dry weather, BBQs will have remained popular. Reflecting this, sales of pork items for a BBQ were promising, with the volume of pork ribs sold up by 3% and marinades recording a rise of 17%. Pork sausages also recorded a 3% rise in sales volumes, with Kantar reporting the category has recruited 420,000 shoppers and featured in 2.2 million more trips. An increase in volumes on promotion (+18% year-on-year) and strong growth from older shoppers has reportedly fuelled this change. In the period, sales of fresh/frozen pork continued to struggle, recording a 3% year-on-year decline in volume. This is particularly disappointing considering there was a 1% decline in average price, as sales on promotion were up year-on-year in volume terms. Within this category, sales of roasting joints were particularly uninspiring, especially for loin roasting joints which decreased in volume by 46%. Beef retail sales have reflected trends in pork, with volume sales of fresh & frozen beef down 5% year-on-year as 1.5 million fewer trips were made; this was again despite an increase in volumes on promotion. Roasting joints recorded a sharp decline in sales of 27%, although frying/grilling steaks managed to secure an increase of 14%. 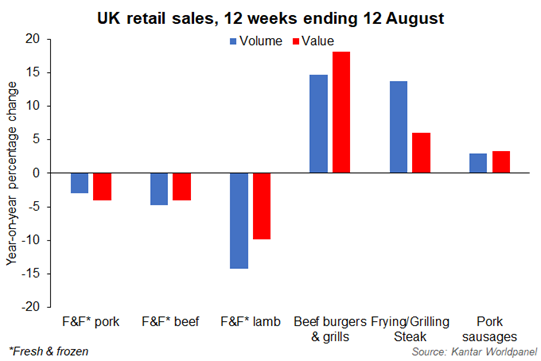 Not only have sausages been sizzling on the BBQs, burgers have also been popular with volume sales up 15% and the value of this market increasing by 18%. Market penetration for burgers also increased by almost 7%. 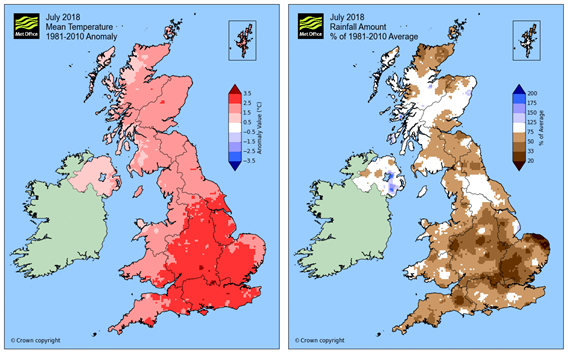 Fresh and frozen lamb sales continued on the trend set earlier in the year, recording a 14% year-on-year decline in the most recent 12-week period. Similar to beef, Kantar reported lamb featured in 3.5 million fewer trips across the period. The total value of the market decreased by only 10%, as the average retail price rose by over 40p/kg, with less product on promotion. Overall, of the red meats, pork recorded the strongest performance with total pig meat* sales volumes recording a small (+0.4%) increase year-on-year. Total beef protein sales remained steady on year earlier levels, while the overall view of lamb was less encouraging, with volumes down 13%. However, when combined with strong growth from chicken, total primary meat sales only declined slightly (-0.5%) on the year. Falling average prices meant the total market was worth 2% less year-on-year though.